OTTAWA, Canada -- A top Ukrainian politician visited Ottawa Thursday to renew a request for defensive weapons to fend off Russia-backed rebels and ask Prime Minister Justin Trudeau’s government for help shoring up support for Kiev both within the Trump administration and among other Group of Seven countries. 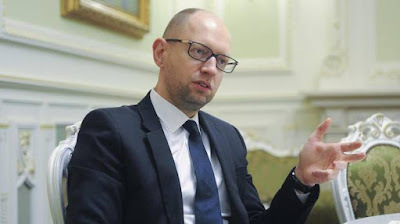 Arseniy Yatsenyuk, 43, resigned as Ukraine’s prime minister last year after coming under fire for a lack of economic growth and slow pace of reforms there. But he remains the leader of the second biggest faction in Ukraine’s parliament and is considered a potential successor to President Petro Poroshenko. More than 1.2 million Canadians claim Ukrainian heritage and this ethnic diaspora has significant influence in Ottawa, where politicians on Tuesday wore traditional Ukrainian embroidered shirts in the Commons to show their solidarity with Ukraine, which saw the Crimean Peninsula annexed by Russia in 2014 and has been fighting a war with Moscow-backed terrorists ever since. The former Obama administration balked at Ukraine’s request for weapons aid, as did Canada. But Mr. Yatsenyuk said the new Trump administration presents a fresh opportunity to seek military assistance – particularly after President Donald Trump just approved a plan to send arms to Kurdish fighters in Iraq. He’s made a similar request of Canada. More than 10,000 people have died in the Russian-backed rebellion in eastern Ukraine since April, 2014. “It’s difficult to deter the Russian military, which was modernized in the last decade and [where] the Russians spent billions of dollars,” Mr. Yatsenyuk said in an interview. “We are the only country who is fighting against the regular Russian forces,” he said. Ukraine needs modern military equipment that it says would only be used for defensive purposes: electronic warfare gear as well as assault drones and anti-tank missiles, he said. Mr. Yatsenyuk met with both Foreign Affairs Minister Chrystia Freeland and Public Safety Minister Ralph Goodale in Ottawa Thursday. Ms. Freeland, a Ukrainian-Canadian, has been targeted by a Russia-backed smear campaign for her efforts in support of Kiev. A Russian government agency recently tried to get Interpol, the international police co-operation organization, to add him to an international wanted list, because it alleged he had killed and injured people in Chechnya in the mid-1990s. The former prime minister says the effort failed though after Kiev wrote Interpol a letter saying the charges were groundless. “They accuse me of killing 30 Russian soldiers in Chechyna and wounding 13. At that time, I was in law school,” Mr. Yatsenyuk said. Ukraine had been worried the pro-Putin Trump administration might bargain away its interests in some kind of grand bargain but Mr. Yatsenyuk, who met with U.S. Foreign Affairs Minister Rex Tillerson this week, said he no longer fears this might be the case. Ukraine needs help however to put its plight more squarely on Mr. Trump’s radar. And to ensure Canada keeps a focus on the matter among Group of Seven members – particularly as the stalled Minsk ceasefire agreement for eastern Ukraine has yet to be fully implemented. “You guys are the members of the Group of Seven club,” Mr. Yatsenyuk said of Canada.